Gems and crystals are one of nature's most fascinating creations and yet, it takes human skills, talent and expertise to bring out the ultimate beauty that exists in gemstones. Lapidary or the art of gem shaping, cutting and polishing is a very old activity, it developed through the years and has often been showcased into a fine art during our times. 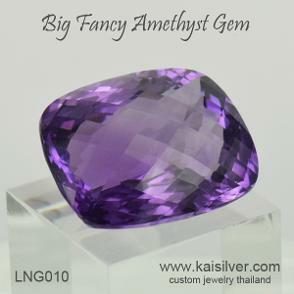 In this section we assemble some of the finest skills in gemstone lapidary. We salute the skills of extremely talented gem cutters while remaining, every grateful to mother nature. Most of the gems shown here are single one-of-a-kind pieces, we might be able to custom cut some of these for you so let us know if something interests you. Each of the gems shown here is unique in terms of size, color, clarity or cut, they cannot be mass produced and we therefore cannot work on market rates per carat. The pieces are perfect for a true gem lover who appreciates not only the beauty of various gems but also, the time and effort that goes into cutting and polishing these natural beauties. Since the volume of rough gemstone required to craft these gorgeous gems is high, we limit the gem selection to moderately priced gemstones. Our support team at sales@kaisilver.com can guide you with gem suitability but, here is a short list of gems that you can consider. Gemstones suitable for such cuts in terms of price and appearance are white quartz, white topaz, citrine, amethyst, smoky quartz, rose quartz, champagne quartz etc. We can also custom cut these and other gem cuts and shapes in dimensions of your choice, so make sure that you explore all possibilities with our team. 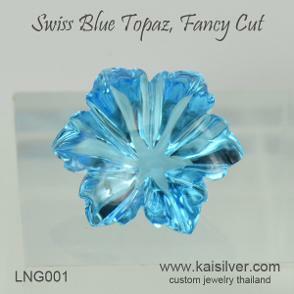 Gorgeous swiss blue topaz flower, very feminine shape and the gem measures 14x14mm, the depth of the stone is approximately 8mm. This swiss blue topaz gem weighs around 15-17 carats. The price of this gemstone flower is just 525 U.S$ ... more. 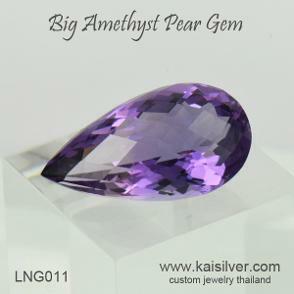 An interesting shape and attractive proportions for this big oval amethyst gemstone. The gem measures around 27x15mm with a depth of 12mm. Weighing approximately 30 carats, this large oval amethyst gemstone is priced at just 975 U.S$. Will make an awesome pendant or an exclusive ring ... more. Eye clean amethyst gemstone cut in a drop shape with checkerboard cuts all around. 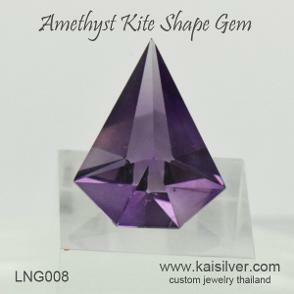 Awesome gem shape and cut for an amethyst pendant or a pair of amethyst earrings. You choose the shape and size and we custom cut the gem for you, some gem ideas are citrine, lemon quartz. amethyst, white topaz, white quartz and smoky quartz ... more. 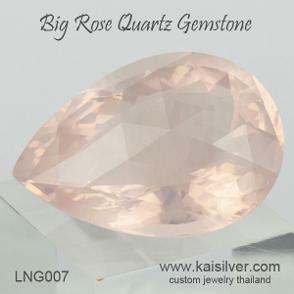 A handpicked big rose quartz gem is given an immaculate pear shape, the size is 24x17mm and the depth is 12mm. The impressive dimensions of this rose quartz gemstone, give it a fine color display. Flaunt the gem in a gorgeous pink gemstone pendant or wear it on a ring. A big weight of 24 carats and a reasonable price of just 525 U.S$ ... more. 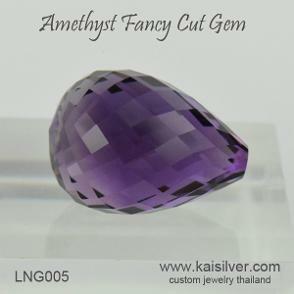 A tremendous gemstone for a ravishing you, a long 20x12mm cushion amethyst gem with a checkerboard cut on the face. The 8mm depth provided for this big amethyst gemstone, makes it suitable for a statement big gemstone ring or an opulent amethyst pendant. A wholesome weight of 12 carats and a price tag of just 475 U.S$ ... more. A fancy pear shaped amethyst gemstone, dimensions to please a princess, 25x12mm and a depth of 13mm. 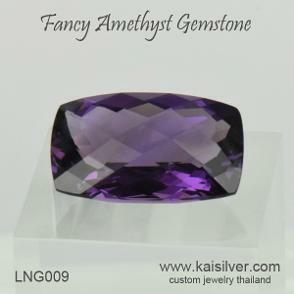 The medium purple color of the gemstone combines with the, checkerboard cut to deliver a spectacular sparkle. Set this tremendous amethyst gem in a pendant or craft it into one of the most desirable amethyst gemstone rings around. The gem weighs around 15 carats and is priced at just 510 U.S$ ... more. 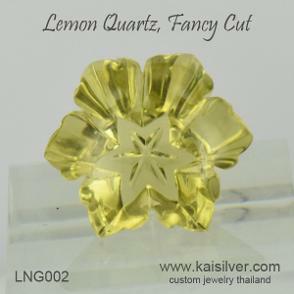 Tremendous lapidary skills showcased in this flower shaped lemon quartz gem, a star appears at the bottom of the gem. The gemstone measures 16x16mm with a depth of around 8mm. The weight of the gem is around 12-15 carats and the price, 450 U.S$ ... more. A big amethyst gemstone with checkerboard cut, the gem measures 18x18mm and has a depth of 13mm. The weight of this large amethyst gem is 22 carats, it is perfect for a big amethyst pendant or a statement making amethyst gem stone ring. 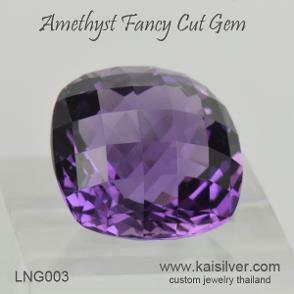 Immaculately cut and a rare size amethyst gem.. Reasonably priced at just 750 U.S$ ... more. 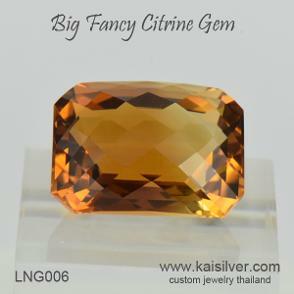 A big citrine gem, fancy cut with checkerboard facets on the face of the gemstone. This large citrine gemstone has a size of 17x14mm and a proportionate depth of 10mm. The gemstone weighs around 17 carats and will make an amazing attention grabbing citrine gemstone ring. Attractively priced at just 490 U.S$ ... more. 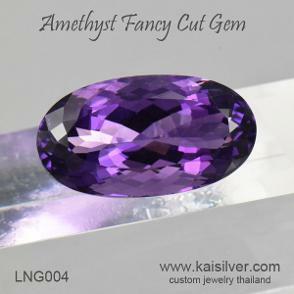 An unusual shape and a master quality cut for this awesome amethyst gemstone. Amazing size of 26x9mm and a depth of 14mm. A very rare amethyst gem fit for the true connoisseur. Set it in a spectacular statement pendant or flaunt it in a one-of-a-kind amethyst ring. Weighs a handsome 20 carats and is priced at 475 U.S$ ... more. A whole 50 carats for this spectacular 27x20mm cushion checkerboard amethyst gemstone. Well proportioned with a depth of 13mm. Excellent sparkle and perfectly cut by gem cutters with decades of experience in cutting the finest gems. Proudly wear this rare and exclusive gem in a pendant, yours for a reasonable 1,200 U.S$ ... more.